Apples of Gold offers a crucifix pendant that captures the ultimate image of faith and sacrifice but with all the elegance and beauty of gold. This two-tone gold pendant features a 14K yellow gold cross that is given a truly golden shine with a highly polished surface. The cross is simple but intriguing and features a cylindrical structure with smooth, angled edges. The pendant's Christ figure is cast in gleaming 14K white gold, with glorious detail throughout. The letters "INRI" are also inscribed in white gold, to complete this stunning pendant. Made in fine-quality 14k yellow gold. Cross measures 1 1/2" tall x 7/8" across (1 3/4" tall with hoop). 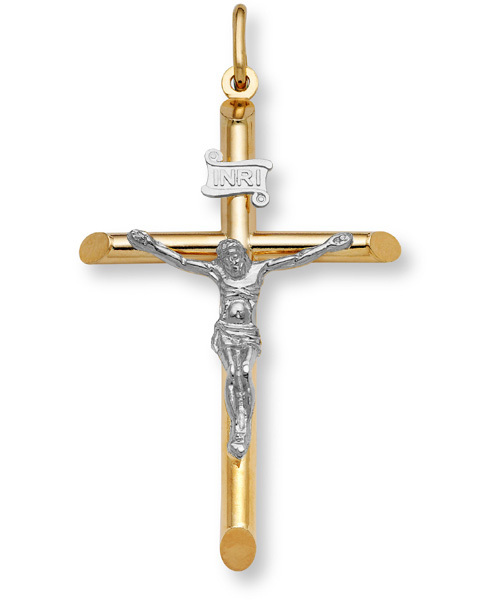 We guarantee our Gold Crucifix Pendant - 14K Two-Tone Gold to be high quality, authentic jewelry, as described above.